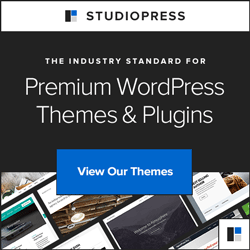 If you’ve ever embedded a PDF file or other downloadable file in WordPress posts or pages using the standard “Add Media” button, you probably know what a pain it can be if and when — but most likely when — that file needs to be updated. You can’t just upload the newly updated file to the Media Library and expect “voila” to happen. Not the end of the earth, but not the best use of anyone’s time, either. Especially if there are lots of documents that get updated or some documents that get updated a lot or some combination of the two. So I created my own plugin — “Downloads” — for replacing downloadable files. A Web site for a private school was the inspiration. 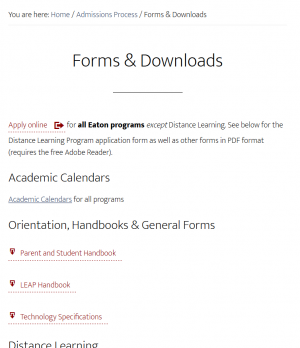 The project that inspired this solution was a Web-site redesign for a private school. 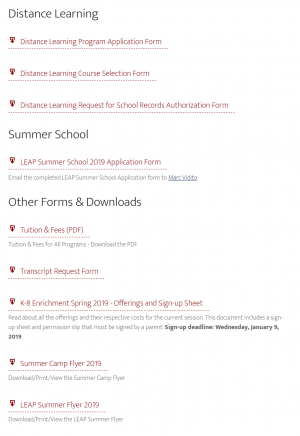 This school — like many, I suppose — offers a whole lot of documents, most of them in PDF format, for students and parents, both actual and prospective. In the rest of this article I’ll describe the basic features, elements and operation of the plugin, without getting too much into the weeds. If you’re interested in learning more, let me know in the comments. One of the main components of the plugin is a custom shortcode used to embed each Download (more on the shortcode below). Each downloadable document can have either a “Start Showing On…” date and/or a “Stop Showing After…” date. Wherever a Download is embedded in a page or post (or widget, for that matter), the plugin “knows” whether to display the link based on those dates and the current date. You can embed a Download on a page or post even before you want it to appear on the front end of the site. This is almost exactly like post-dating a blog post to schedule it to appear in the future. Conversely, the plugin will automatically hide any Download that should not appear after a specific date. (For example, you might want to remove a field trip application form after the field trip occurs.) You needn’t edit the page(s) or post(s) to manually remove the embed, as long as you specified the proper date parameters. 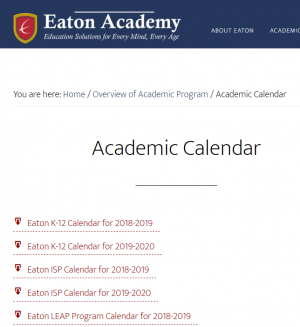 The site has a dedicated page for Academic Calendars. As I mentioned earlier, there are calendars for each of the three main programs the school offers. 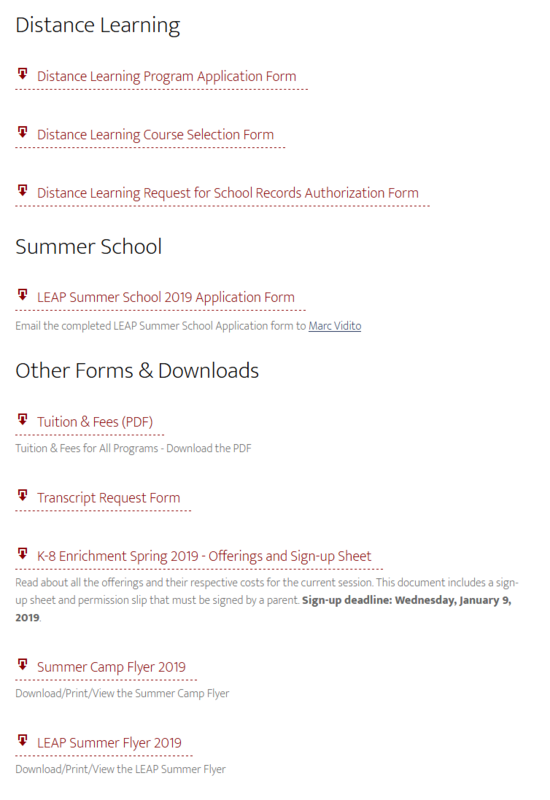 In addition, at any given time of year, the calendars for multiple school years for any given program might be displayed. 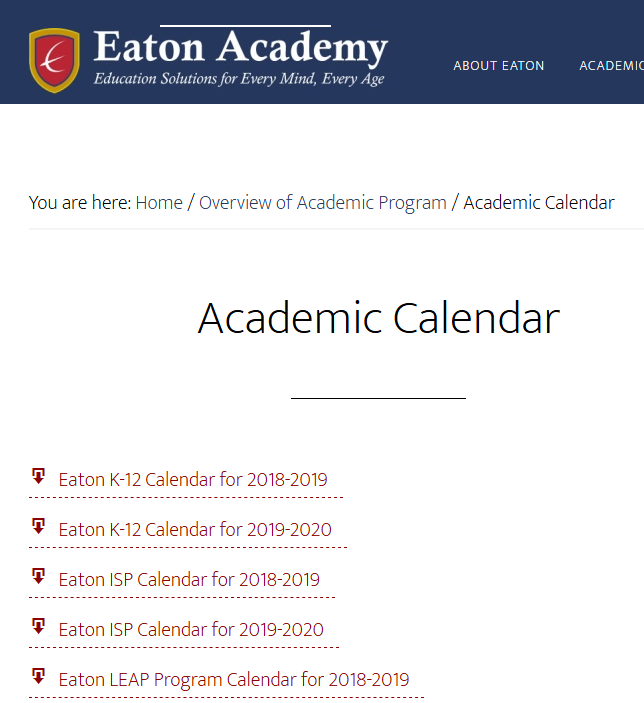 For example, in the spring of the 2018-2019 school year, both the current school year calendar (2018-2019) and the next school year calendar (2019-2020, if available) for the K-12 will be displayed. I made a custom template for this page. The template’s code automatically displays the link for every downloadable document whose type (custom taxonomy) is “Calendar” as long as the current date is on or after the designated “Start Showing On…” date and on or before the “Stop Showing After…” date. This is the feature that drove me to create the plugin in the first place. Invariably, Downloads need to be replaced from time to time, due either to errors or actual changes. Because each downloadable document is identified by its post ID — rather than by its filename — you can just replace the obsolete document with the new one in the Downloads administrative panel, and voila! Then add the new file. The Custom Post Type itself is very simple. 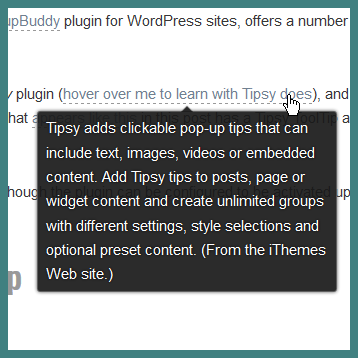 This new post type (named “Download”) supports only the ‘title’ and “page-attributes” features of WordPress’ post edit screen. The ‘title’ is the internal (for office use only) name for the download. Enabling page attributes permits assigning order values, for the purpose of sorting, where desired. This is where the meaty stuff of the plugin happens. I registered a custom taxonomy called “download_cat” and associated it with the Downloads custom post type. As of this writing, the only download_cat value that has any special power is “Calendar”. As I mentioned above, the template’s code automatically displays the HTML for every downloadable document whose type (download_cat) is “Calendar” as long as the current date is on or after the designated “Start Showing On…” date and on or before the “Stop Showing After…” date. 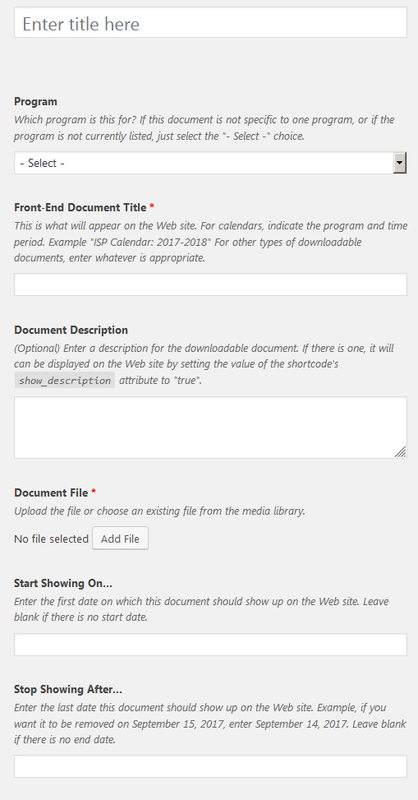 The format for the shortcode that embeds a Download into a page or post is as follows. The only required attribute is the id. Where I show optional values for attributes (e.g., “true|false”), the first element is the default. 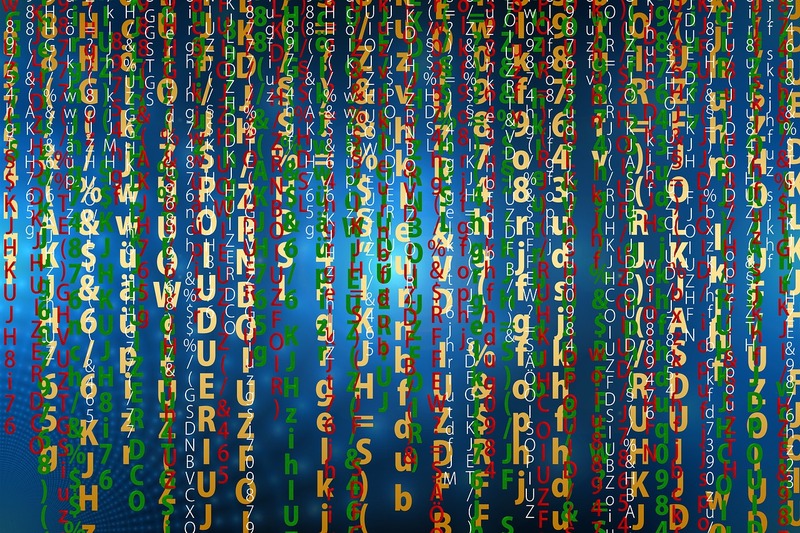 Here’s the actual code for generating the HTML from the shortcode. If you’re interested in a description of how it works, let me know. 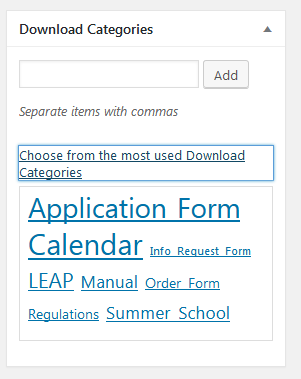 Here are pertient blocks of code from the custom page template for grabbing and diplaying academic calendars. Again, if anyone is interested in more information, please let me know. 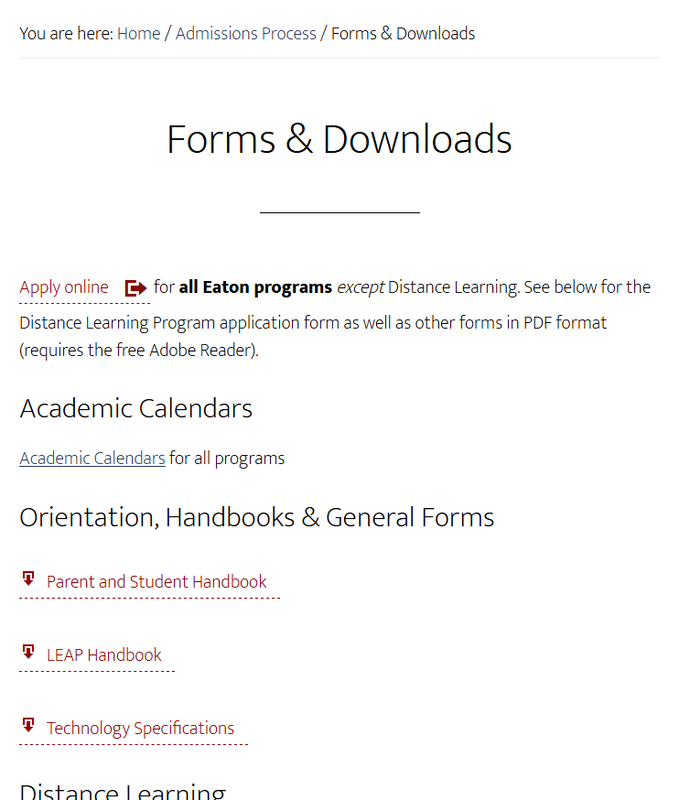 Here are screen shots of the “Forms & Downloads” page followed by the code that makes it happen. I guess I ended up covering a lot of ground after all. But if you have questions or are interested in knowing more, please let me know in the comments below.